Demaryius Antwon Thomas was born on the 25th December 1987, in Montrose, Georgia USA, andis recognized for being a professional American Football player, who plays in the position of wide receiver in the National Football League (NFL) for the Denver Broncos. Previously, he played college football for Georgia Tech. His professional playing career has been active since 2010. So, have you ever wondered how rich Demaryius Thomas is, as of early 2017? According to authoritative sources, it has been estimated that the total size of Thomas’ net worth is over $9.5 million; his salary per year is $3.5 million. This amount of money has been accumulated through his successful career in the sports industry. 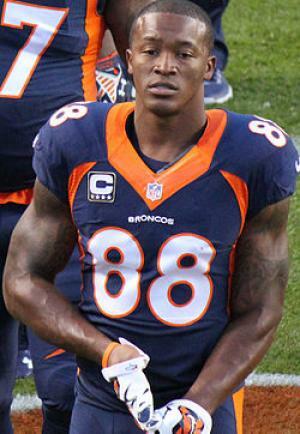 Demaryius Thomas was brought up with two sisters by his father, Bobby Thomas, and mother, Katina Smith, who was selling drugs and so was sentenced to 20 years in jail; thus he was raised by his uncle and aunt. He went to West Laurens High School in Dexter, Georgia, where he distinguished himself in playing football, basketball and in track & field. However, he decided to pursue a career in football, playing in the position of wide receiver under the coach Andrew Slome. In his junior year, Thomas had 32 receptions for 330 yards, and 3 touchdowns, so he was named all-Heart of Georgia player, as well as an all-region player. During the next year, he set the record with 82 receptions for 1,234 yards and 10 touchdowns, and he competed in the North-South All-Star game, which led him to become named Class AA all-state first team by the Atlanta Journal Constitution. Upon matriculation, he enrolled at the Georgia Institute of Technology on a scholarship, where he continued playing football, for the college team. As a freshman he was named to the All-Atlantic Coast Conference (ACC) first team, and again in 2009, finishing his college career with 120 catches for 2,339 yards and 14 touchdowns. Following graduation, Thomas entered the 2010 NFL Draft, in which he was selected in the first round as the 22nd overall pick by the Denver Broncos, so he signed a rookie contract worth $12 million over five years, which marked the beginning of his net worth. He made his debut in the game against the Seattle Seahawks, recording eight receptions for 97 yards, becoming the 9th player in the NFL who did that in his debut game. In the same season, he gained popularity by beating All-Pro cornerback Darrelle Revis for a touchdown in the game against the New York Jets. Although he had several injuries, he finished the season appearing in 10 games, with 22 receptions for 283 yards and two touchdowns. At the beginning of the next season, he had an injury and missed the first five games.However, in 2012 Thomas distinguished himself as a player, when he caught a game-winning 80-yard touchdown pass, his team defeating the Pittsburgh Steelers in the AFC Wild Card game. During the same year, he also set career highs in catches and yards in games against the Cleveland Browns and Carolina Panthers, thanks to which he was voted to the Pro Bowl, which increased his net worth by a large margin. In the 2013 season, Thomas again excelled in playing, earning AFC Offensive Player of the Week honors in the Broncos’ Week 10, as well as breaking several records, including the most touchdowns and passing yards, with 92 catches for 1430 yards and 14 touchdowns. Thus, he was again selected to the Pro Bowl and he was named All-Pro team. Beside that, he participated in the Super Bowl XLVIII, when he had 13 receptions for 118 yards and a touchdown in losing to the Seattle Seahawks. All contributed to his wealth. In the 2014 season, he had 8 receptions for 226 receiving yards against the Arizona Cardinals, and he caught his all-time record-breaking 509th touchdown pass. Furthermore, in 2015 his five-year contract worth $70 million with the Broncos was extended, and in the same year he won his first Super Bowl title, when the team defeated the Carolina Panthers. He still plays for the team, and his net worth is certainly rising. Regarding to his personal life, Demaryius Thomas is in a relationship with Surina. Previously, he dated Camille Washington.